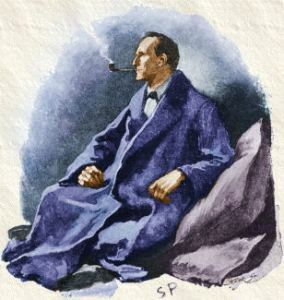 As an example of what I plan to do with the Parallel Reading project, below is a sample of a parallel English/Spanish text of the Sherlock Holmes short story “The Speckled Band,” by Arthur Conan Doyle. This is a parallel text composed from public-domain sources. Click on the link to download this free ebook in PDF format. Abajo se encuentra el relato “La banda de lunares” en el inglés y el español en paralelo. Este es un relato ficcional de Sherlock Holmes por Arthur Conon Doyle. Haga clic en el enlace para descargar el libro electronico. This article in Archaeology includes sound files of linguists telling brief stories in the reconstructed hypothetical Proto-Indo-European language. A sheep that had no wool saw horses, one of them pulling a heavy wagon, one carrying a big load, and one carrying a man quickly. The sheep said to the horses: “My heart pains me, seeing a man driving horses.” The horses said: “Listen, sheep, our hearts pain us when we see this: a man, the master, makes the wool of the sheep into a warm garment for himself. And the sheep has no wool.” Having heard this, the sheep fled into the plain. A. Roy King outlines the seven metals on which civilization was built and points to some useful resources.